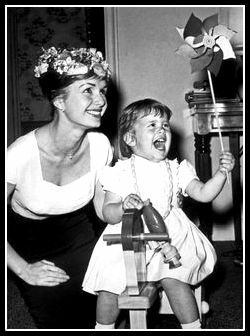 I have been thinking a lot about Debbie Reynolds over the last few hours since the death of her daughter, Carrie Fisher, was announced yesterday. Watching my mother deal with the death of my brother many years ago, I have a small glimpse into some of the things that she may be feeling...shock certainly, your children shouldn't die before you do...fantasy, this is a nightmare and I will wake up soon...practicality, I need to do this this and this...more or less a maelstrom of emotions that swirl to keep you upright while you deal with the immediate, not letting the past or future take you down. You're simply rowing...just as she did as Molly Brown...unsinkable, taking one wave at a time, steering the course. Through the years she has faced many difficulties...marriages that didn't work out, family issues...money problems...things that all of us do, but fortunately we don't have do it in the klieg light glare of the world's scrutiny...we can crawl into our individual holes, deal with it and move on. I would think for a parent that this would be the ultimate iceberg...ripping a 300-foot gash into your heart, breaching all of the water-tight compartments of your eyes, stopping the propeller as your body goes through stresses that it was never designed for...monumental wrenches against trusses never built with enough strength to endure this. But she has braved pretty big icebergs in the past...and the one thing she kept doing was rowing...one wave at a time, buoyed by hope...and as we know hope floats. She may not feel particularly like Molly Brown at this moment, but somewhere within her Molly is there...just as each of us have our own Mollies who take us through difficult and unimaginable personal places of hell in our own lives, Mollies that get us through the day, Mollies that come out when we see something like this...a mother losing her child...and wish we could send some of our own Molly to someone else. I am sure Debbie has her oars in the water...but it must be a pretty painful pull, but I suspect that somehow she will do it with grace, and touch us as the klieg lights are on her once again, when she probably wants to merely be in as dark a room as possible...and we will watch as she puts her oars in the water, and slowly start to pull her lifeboat forward. I just wish I could send one of my Mollies to her right now as she steps into the boat...the Titanic wasn't strong enough to survive the iceberg encounter, but people are...and Debbie will. Keep rowing...one small wave at a time.